Institutional Shareholder Services has unintentionally taken on Hillary Clinton and Larry Fink. At the moment, ISS is winning. The proxy adviser, whose customers control a combined $25 trillion in assets, has helped drive the trend toward rewarding executives for share-price gains. 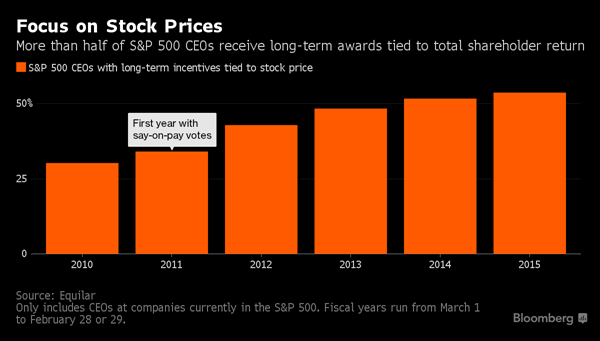 Today, more than half the chief executive officers of S&P 500 companies receive compensation partly determined by shareholder return, according to Equilar Inc. That’s doubled since non-binding “say-on-pay” shareholder votes on compensation were introduced in 2011. “ISS has been a major influence,” said Joe Sorrentino, managing director at executive compensation firm Steven Hall & Partners. In its recommendations to subscribers, ISS compares a company’s CEO pay and its total shareholder return -- the change in stock price plus dividends paid -- to those of competitors. A mismatch between pay and three-year relative stock performance can result in ISS urging clients to vote against the company’s pay plan and reject directors serving on the board’s compensation committee. Big investors such as BlackRock employ their own proxy analysts to comb through compensation data to prepare for shareholder meetings. Smaller money managers, on the other hand, tend to rely on advisers. ISS’s recommendations aren’t binding, but research suggests that ISS reports can affect as much as 20 percent of the shareholder vote, according to David Larcker, a professor of accounting at Stanford University. That would worry any director. “Against” votes can draw the attention of reporters, help fuel activist investor campaigns and embarrass directors. That’s made Rockville, Maryland-based ISS a force in U.S. boardrooms and resulted in stronger ties between executive pay and stock returns. A spokesman for the 900-employee firm declined to comment. Its voting recommendations for say-on-pay elections are also based on factors including the company’s financial results, the share of pay tied to goals, and company-specific variables. The firm is soliciting feedback from clients on whether its quantitative assessment of corporate performance should be based on measurements in addition to stock performance. Boards typically link shareholder return to a portion of CEOs’ long-term awards, which often consist of equity that’s earned over three years. Stock grants tied to performance have become common in the last decade as directors and investors communicate more closely about pay. Supporters say it helps align the interests of management and shareholders. Executives typically benefit doubly since strong stock-price growth boosts both the number of shares they receive and the value of each security. But Michael Sirkin, an executive compensation partner at law firm Proskauer Rose LLP, says stock return is a “lazy man’s metric” better suited for measuring performance than driving it. Focusing on desired financial outcomes is a better way to drive long-term shareholder value since share prices are in many instances outside executives’ control, he said. Linking CEO pay to stock return can also encourage managers to focus on short-term gains rather than building the business for the long haul, according to William Lazonick, co-director of the Center for Industrial Competitiveness at the University of Massachusetts at Lowell. “You’re incentivizing executives to do whatever they can to get the stock price up,” he said. Evidence of corporate America’s efforts to buoy share prices, sometimes at the expense of a wider vision, is everywhere. Mergers and acquisitions, popular with some investors, hit a peak globally in 2015. S&P 500 companies spent more than $2 trillion purchasing their own shares since 2009, dwarfing every other buyer in the equity market. U.S. businesses in June funded buybacks with debt at the highest rate since 2001, according to data compiled by JPMorgan Chase & Co. and Bloomberg. In a February letter to U.S. CEOs, BlackRock’s Fink discouraged the practice of returning cash to shareholders “at the expense of value-creating investment” and pointed out that dividends paid by S&P 500 companies in 2015 amounted to the highest proportion of earnings since 2009. While buybacks and dividends can give temporary bumps to stock prices, they can also come in lieu of efforts that might be better for a company’s long-term health and the U.S. economy in general, such as investing in research and development, building new factories or hiring and training workers. Companies should develop financial metrics “that support a framework for long-term growth” and link them to long-term compensation, Fink wrote. But how? Many boards struggle to set financial targets for performance periods that last several years, said Amy Wood, a partner at law firm Cooley LLP in San Diego. Determining payouts by using shareholder return relative to a group of peer companies can be a middle-way solution that satisfies both investors and proxy advisers despite falling short as a motivational metric, she said. Another potential snag: Executives can exceed financial targets and still be punished because their success isn’t reflected in the share price, according to Ira Kay, managing partner at compensation consultant Pay Governance.